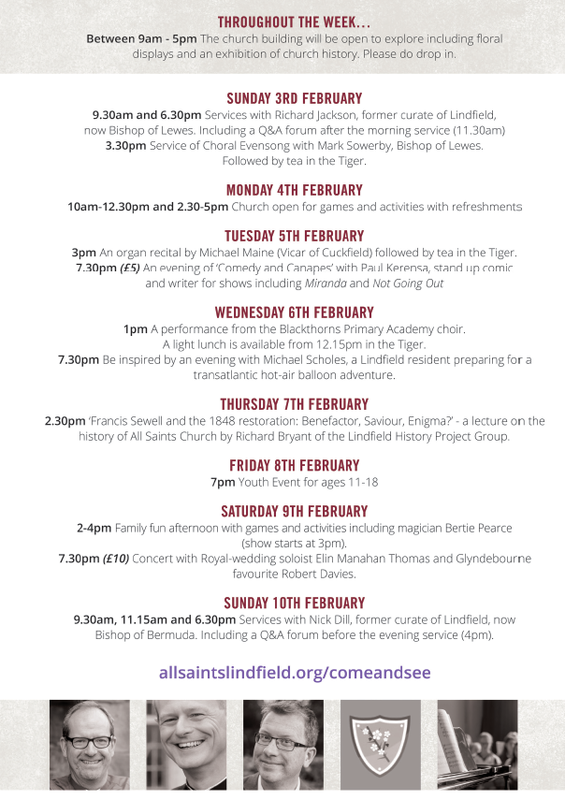 All Saints Church will reopen its doors and celebrate with a special week of events from Sunday 3rd February 2019. The church building has been closed since April last year, as part of a large refurbishment project which includes relaying the stone floor and making it one level throughout and installing underfloor heating beneath it. Services will return to the church building from Sunday 27th January, after the congregation has been temporarily using Lindfield Primary Academy school hall during the building works. ‘Come and See’ is a week of events (right) that are being held in the church to celebrate its reopening and to give villagers a chance to see the new space at the top of the High Street. Included as part of the week are a Blackthorns Primary Academy Choir concert, a history talk by Richard Bryant and ‘Comedy & Canapes’ with Paul Kerensa.